Manila, 2017 – Tired of makeup products that fail and melt down at the end of a long, busy day? The world leader in beauty, L'Oréal Makeup Designer/Paris, invites you to finally say goodbye to makeup meltdown with the much-anticipated, globally acclaimed long-wearing makeup line that’s finally in the Philippines. 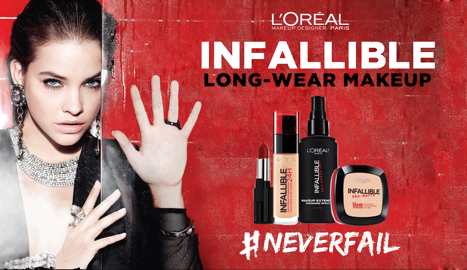 Introducing INFALLIBLE – a full range #NEVERFAIL makeup from L'Oréal Makeup Designer/Paris. INFALLIBLE answers every modern Filipina’s battle cry to fight makeup meltdown with a complete line of long-wearing makeup: INFALLIBLE 24HR Foundation, INFALLIBLE 10HR Lipstick, INFALLIBLE PRO-MATTE 16HR Powder, and INFALLIBLE PRO-SPRAY & SET Makeup Extender & Setting Spray. 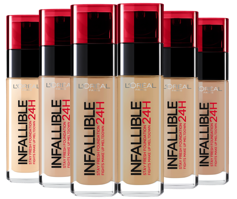 INFALLIBLE 24HR FOUNDATION is the first foundation from L'Oréal Makeup Designer/Paris that promises to fight makeup meltdown and stay fresh all day. Lasting for up to 24 hours, Infallible’s lightweight formula gives flawless, full coverage that conceals visible imperfections, and a demi-matte finish with no visible shine. Powered by extreme hold pigments that adhere to skin, and hydrating hyaluron that gives optimum skin comfort, this long-wearing foundation guarantees no makeup meltdown from morning till night. Infallible 24HR Foundation comes in 6 shades that match Filipina skin tones, now available at L'Oréal Paris makeup counters and official online retailers for only Php700 SRP. Introducing a lipstick that lasts from morning coffee to evening wine. Bid adieu to makeup fails like fading and flaking, and welcome sophisticated, high-impact color that lasts all day with the new INFALLIBLE 10HR LIPSTICK from L'Oréal Makeup Designer/Paris. Infused with hydrating vitamin E, this lipstick stays fresh and vibrant for up to 10 hours, without feeling tacky or dry. Infallible’s highly-pigmented, creamy formula glides easily on the lips, and applies glossy at first, but eventually sets with a demi-matte finish. Infallible 10HR Lipstick comes in an expansive range of 20 shades: from subdued nudes, to vibrant reds and pinks, to bold and deep hues. These lipsticks are now available in L'Oréal Paris makeup counters and official online retailers for only Php500 SRP. Complete your #NEVERFAIL makeup look with INFALLIBLE PRO-MATTE 16HR POWDER. This long-wearing, shine-defying powder creates a perfectly matte finish without looking flat or cakey. It absorbs excess oil and reduces shine on the skin’s surface for up to 16 hours. This lightweight pressed powder can be used alone, to set foundation after application or throughout the day for quick touch-ups. Infallible Pro-Matte 16HR Powder is available in 6 shades in L'Oréal Paris makeup counters and official online retailers for only Php600 SRP. Set your makeup to last all day with INFALLIBLE PRO-SPRAY & SET Makeup Extender & Setting Spray. This lightweight, oil-free spray can be applied after makeup over your face, eyes, and lips to lock in your whole makeup look. It ensures that your makeup stays fresh and “just-applied” the entire day, and prevents melting, fading and smudging. Infallible Pro-Spray & Set is available in L'Oréal Paris makeup counters and official online retailers for only Php500 SRP.